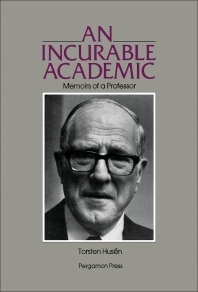 In these memoirs, Torsten Husen, Professor Emeritus of Education at the University of Stockholm, conveys a fascinating picture of the academic world from the l940s onwards and of the extraordinary developments in education and psychology. Professor Husen is an internationally acknowledged expert on school affairs. As the first holder of the Chair of Educational Research at the Stockholm School of Education, he became deeply involved in policy research tied to the school reforms and his research and writing have directly affected the worldwide debate on the structure and content of secondary and upper secondary schooling. He was a founder member of the International Association for the Evaluation of Educational Achievement (IEA) and as Chairman of the Board of the International Institute for Education Planning (IIEP) in Paris he became increasingly concerned with educational problems in the developing countries. This is an account of a remarkable man whose dedication to research into educational problems worldwide should be an inspiration to others. (partial) Preface. My background. Preparing to Become a Professor: Applying for a professorship. Appointment as senior lecturer and application for the chair in Stockholm. Professor at Various Institutions: At Stockholm university. Studies and arguments concerning the differentiation issue. My political position on schooling. A digression on teacher training. A Scholar Among Policymakers: Military Psychology: Psychological testing and controversies surrounding its use. Defence against psychological warfare. Travels: Congresses, Conferences, Seminars: Professional Contacts with America: The Aspen Institute for Humanistic Studies. Perkins "Mafia": Comparative studies of higher education. Reviewing National Systems of Education: On Writing: Brief Glimpses of a Busy Life: Views on life and scholarship. Preparing an International Encyclopedia of Education. Epilogue - An Incurable Academic: Index of Persons.